Reflections on Manifesting a Cargo Bike! Shelby Sanchez with both of her daughters out enjoying a beautiful day in Long Beach. We’ve been the proud owners of the Babboe Big for a week and I couldn’t be happier. My three year old, Mila and one year old, Sage and I love riding down the Long Beach bike path allowing all the elements to contribute to our being...allowing the salty wind run through our hair, enjoying the warmth of the sunshine kiss our faces, feeling the presence of the vast ocean at our side, watching a brown hawk fly across our path, seeing all the moving parts of creation as we ride is so uplifting and inspiring. We also get to see the diversity of Long Beach residents who are also enjoying being outside. We live in the Alamitos Bay area of Long Beach near Cherry Ave. and every morning during the week I will be riding down the bike path to drop off my girls with my grandmother in Belmont Shore for the morning so I can give my gift to small business as a Creative Marketing Strategist at Dream Inspired Design. Since beginning to ride again I have increased energy and focus in my work. Riding on my bike is also allowing me to have at least thirty minutes a day to be in a moving meditation and connect with my highest aspirations. It is win-win-win...for my girls, me, and the earth. I couldn’t recommend it enough to parents who want to feel a sense of greater connection and freedom. 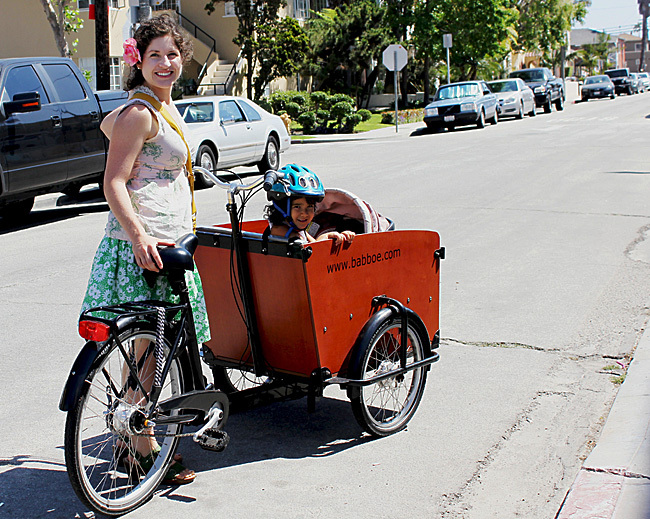 Having a cargo bike is contributing to my vision for a simple, beautiful, more harmonious life experience. I am so grateful and look forward to sharing this unfolding journey with you all. I started looking at photos of various cargo bikes and envisioning which would be best for our family. Pinterest is a good resource for this. Every time I was in my car driving I envisioned us riding on our cargo bike, every time I was filling the pump I imagined taking my bike to the bike shop instead. I had started attracting ‘bike people’ ;) The wonderful Melissa Balmer showed up on my path and connected me with who others were current owners of cargo bikes. April Economides of Green Octopus Consulting showed up and suggested that I contact the city about potentially purchasing their Christiana cargo bike that was not being used. I also started doing searches on Craigslist for used cargo bikes. A few results would show up under the broad term ‘cargo bike’ but I soon realized my results were much better upon doing more specific searches of the numerous cargo bike brands that exist such as...Trio Bike, Babboe, Johnny Loco, Christiana, CETMA Cargo, and more list of worldwide options.